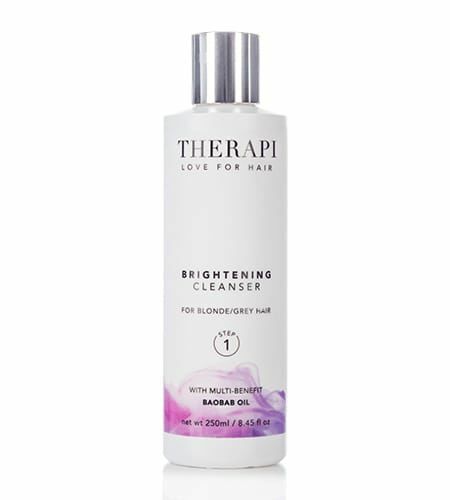 THERAPI Brightening Cleanser, enriched with Baobab Oil, provides the perfect solution for enhancing brightening tones and reducing brassiness in blonde, white or grey hair. 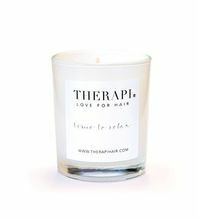 For best results use once a week in place of the THERAPI Signature Cleanser. 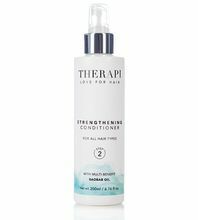 Apply to wet hair and massage into a rich lather for 1-2 minutes, rinse thoroughly and repeat if desired. 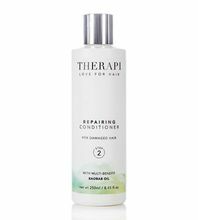 For salon results follow with a Step 2 THERAPI Conditioner suited to your hair type. Aqua (Water), Cocamidopropyl Betaine, Sodium Lauroyl Methyl Isethionate, Sodium Chloride, Parfum (Fragrance), Benzyl Alcohol, PEG-6 Caprylic/Capric Glycerides, PEG-150 Pentaerythrityl Tetrastearate, Quaternium-80, Phenoxyethanol, Disodium EDTA, Xanthan Gum, Polyquaternium-10, Butylene Glycol, Keratin Amino Acids, Hexyl Cinnamal, Dehydroacetic Acid, Helianthus Annuus (Sunflower) Seed Extract, Coumarin, Linalool, Limonene, Hydrolyzed Lupine Seed Extract, Adansonia Digitata (Baobab) Seed Oil, Citronellol, Gluconolactone, Sodium Benzoate, EDTA, CI 60730 (Acid Violet 43).